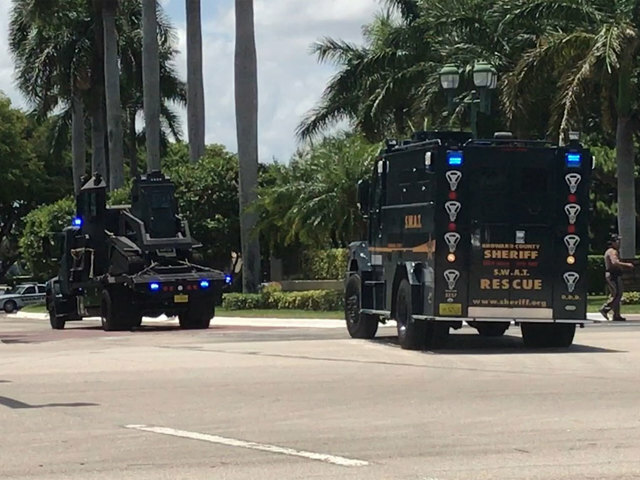 A Broward County deputy was involved in a standoff Sunday afternoon with Palm Beach County sheriff's deputies at the Boca Country club in West Boca Raton. According to the PBSO, at about 11 a.m., Broward County sheriff's deputies responded to the residence of one of their deputies regarding a domestic incident. Upon arrival, BSO deputies removed the deputy's firearm. PBSO says the Broward deputy involved in the domestic incident then jumped in his cruiser and drove to his ex-wife's residence inside the Boca Country Club. She was not at home when he arrived. PBSO says at that point, he threatened to harm himself. PBSO brought their SWAT team and other equipment to the scene because of the possibility that he may have had a secondary weapon. The deputy later surrendered to PBSO without incident. He was placed into custody under the Baker Act. The Florida Mental Health Act of 1971, commonly known as the "Baker Act," allows the involuntary institutionalization and examination of an individual. No one was harmed during the incident. The deputy has not been identified.